I am a Single Mother by Choice and a twin mom, and I fell into the terrified camp when I learned my embryo adoption had been extremely successful. We managed with the help of my grown daughter for the first two years. 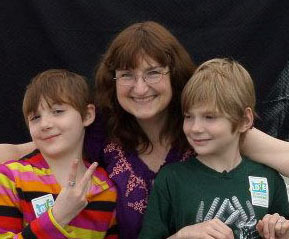 My twins seemed to be having more struggles than is typical, and eventually both were diagnosed with autism. Tossing tenure and a good salary, we moved to where the services were, as I wasn’t about to accept the possible future that had been painted for them by some experts. Now almost ten years old, both children are fully mainstreamed and completely communicative. While each has had significant setbacks at times, they are both quite successful in their own ways. When beginning my SMC journey, a double dose of autism was not even among the subjects I pondered as a thinker. I knew my life was about to change, but how it changed had been foreseen by no one, much less myself. There are times I think I am fortunate, as I’ve seen so many marriages dissolved by the nonstop stress caused by autism. No arguments about therapies, alternative treatments, or educational choices. I did the research; the decision, for better or worse, was mine alone to make. But then there are those other times…. The family budget is not supported by one, much less two full time jobs because the demands of therapy schedules and doctor’s appointments conflict with a full time job. The times when autistic meltdowns require my full attention, and there isn’t another set of eyes to supervise the second twin. The times when I am honest and admit to myself that it is highly unlikely I will ever return to the career I so loved — a career deliberately chosen because it fit so well with single parenting. I never expected the isolation, the struggle for services, or the judgement of strangers. But here I am. Would it have been significantly different if I had had only one with autism? I don’t know. Half the stress is surely a nice thing to ponder. Managing one child would definitely be easier. But when I see the two of them interacting, I cannot overlook the fact that each twin came with their own, personal therapist. Neither was able to escape into their own world for very long, as the second twin was always nearby, dragging the first twin into the common reality that we, as social beings, share. Even my twin with the more classical form of autism was considered to be more aware of and interactive with people, than was to be expected. I truly believe that in our case, twin-hood has been my children’s lifesaver. Difficult on the mommy? You bet! But it was a positive intervention factor that has greatly enhanced my children’s outcomes. You are so strong – I hope you are writing a book about your journey. Beautifully written…thanks for sharing your story.